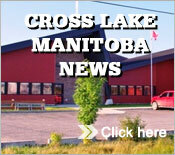 Two closely related, adjoining, but independent communities are both known as Cross Lake. One is the Incorporated Community of Cross Lake on Crown land, and the other is located on the nearby Cross Lake Indian Reserve. The information in this website relates to the Incorporated Community of Cross Lake unless otherwise noted. By air the community is located approximately 520 kilometres north of Winnipeg, and 120 kilometres south of Thompson. It is situated on the shores of the Nelson River where the river enters Cross Lake. Located on Provincial Highway 374.